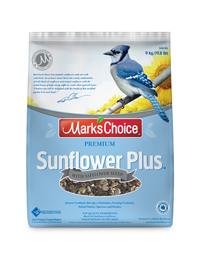 I have spent a lot of money on large bags of black oil sunflower seed over the years. The birds in my neighbourhood just seem to love it. However, not all birds love the black oil as much as the striped – or for that matter the safflower seeds (that squirrels hate, by the way). So we have mixed them into a tasty combination of quality bird seed that appeals to the broadest possible pallet of bird taste buds.